I'd been sick for a few days and holding down the sofa. I hadn't even been online much, and I suppose that's why I didn't know. I was driving down to Mac Island a few days later, crossing the new bridge, and I noticed something was missing. Something was different. Something was gone. That something? The green bridge. That bridge, the one that carried all our traffic for years, was gone. And that simple change was not only a sign of change in a bridge - I think it's a sign of change in our region. I remember when I first moved here a decade ago. We arrived in late summer, and got a taxi from the airport to our temporary residence in Thickwood. I remember driving down into the valley, and thinking what a lovely little place this seemed to be. You see, I'd never been here before. My husband had come when he had interviewed for his job, but I had stayed behind in northwestern Ontario with the youngest Intrepid Junior Blogger, who was only two. So I arrived here not knowing a thing about the community, or what it looked like. And I remember driving across the green bridge. 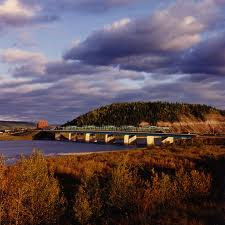 I grew up in Saskatoon, the "city of bridges", and there is one of those iconic bridges there, too. The Victoria Avenue bridge is black, not green, and so old it is now closed to traffic, I think, except that of the pedestrian kind. But it is a bridge similar to the green one, designed in an older style and sort of becoming such a part of the landscape that you don't even realize it's quite unusual. I guess our green bridge was like that, too. I didn't even realize I would miss it - until it was gone. 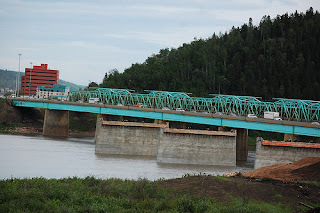 I have photos of the green bridge, taken when we lived in Abasand and would walk the trails there, one of which has a lookout point that looks directly over that area of the river. The green bridge features prominently in several of the photos we took there, and I'm betting many other people have photos of it, too. I don't think we have many structures here that we find recognizable, really. The purple student residence at Keyano, maybe, and the red municipal and provincial buildings. But for me I think the bridge is different. There is symbolism in a bridge, the connecting of two separate parts. The bridge will remain, I guess, but different. Changed. Just like we have. This region is ever changing, but some things have stayed the same for years. The sense that this was a small town, not a city. The idea that we were somehow remote. The belief that we were somehow "underdogs". And it's all changing, people. We are on the verge of the kind of rapid growth that will leave us not only a city, but a good sized one. We are not nearly as remote as we have been in the past, now connected to the world not only by road but by air - and by the internet. And we are no longer any kind of underdog, having become the economic driver of our province - and our country. We have changed, Fort Mac. And we are going to keep changing, in ways both invisible and visible. The green bridge is one of the visible changes - and to me it is symbolic of all the change to come. I will miss the green bridge as it was, but I know the change heralds the beginning of a new era in our transportation. I will miss the Fort McMurray I arrived in a decade ago, but I know the changes that are occurring (and that are coming) will only make us better. It is sad to say farewell to the green bridge - but it is also exciting to welcome the future. We are changing, people, and one small, old green bridge is perhaps the most visible sign of that change. I drove my husband to the airport the other day. He hadn't been across the bridge in some time, and when I asked him what was different he couldn't answer. When I told him he exclaimed "Oh yeah, it IS gone!". And in the future others will never even know that it was there. New residents will come and they will never know what the green bridge looked like. But I will. I'll remember arriving here in August, driving across that bridge, thinking of the city I grew up with it's black bridge, and thinking about how my daughter was going to grow up in this city. It's a memory I will never forget, and so the green bridge will always be there - in my memory, and in the memory of many others. I'll think of the Green Bridge when I recall my daughter learning to talk. She used to get so excited when we drove over the bridge, squealing "Affabassa"!!! I believe it was called the Grant McEwan bridge. Although I grew up calling it the green bridge. It has always reminded me of the northern lights. I will miss it. It was a quinisential symbol of Fort Mac. Losing that landmark, for me, is just as sad as it will be to find our provincial buildings missing from the skyline one day. I know change in this town is inevitable, and in the end, for the better, but I wish we could have kept that little piece of our history as a memory of our more humble beginings.